Every month, Counterman’s “Guess the Car” contest challenges our readers to solve an automotive riddle, for a chance to win $100. And each month, we receive hundreds of responses from aftermarket professionals trying to guess the model of the vehicle depicted. 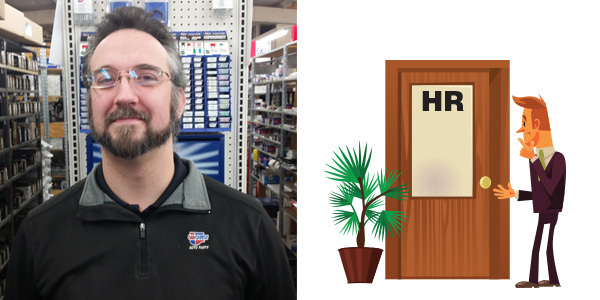 The winner for January is Jake Myers, a counter pro at Carquest in Louisiana, Missouri. Now, let’s get to know the January “Guess the Car” champion. CM: How long have you been working in the auto parts business? JM: It’s been about nine years. CM: What do you like most about your job? JM: I’d have to say that it’s different every day. With a lot of jobs, you come in and you do the same things all day long. With this job, you never know who’s going to come in and what they’re going to be looking for. I like the change of pace from day to day. CM: What’s the strangest question a customer has asked you? JM: Usually the ones that throw me off are when people ask if their car has something that every car has. For example, “Does my car have an alternator?” Or someone will ask, “Can I change the oil in my car?” A lot of people nowadays drive cars and really have no idea what they are and how they work. When they ask very basic questions like that, it can throw you off for a moment. CM: The car culture seems to be going away. JM: And a lot of people come in not even knowing what they’re driving. A customer will come in asking for a part. You ask them what kind of car they have and they’ll say, “I don’t know. It’s that one.” It happens a lot more than I would have ever believed before I started doing this job. CM: Are you a car person? JM: Oh absolutely. All my life. CM: What’s the coolest car you’ve ever owned or worked on? JM: This is an odd one. I have a 1988 Toyota Corolla GTS. It isn’t even a Toyota Corolla, but they slapped that badge on it when it was imported into the U.S. In other parts of the world, they call it a Sprinter. And the enthusiasts call it an AE92. It was one of those cars they built just for the homologation rule; they made enough of them so they could base their rally car off of it. It can take corners like it’s on rails and has a 9,000-rpm redline, so it’s not something you would normally drive. CM: Do you still have it? JM: Yes I do. But unfortunately I was at the store about a year ago and someone in the parking lot drove right through it. So it has some considerable damage to the rear end that I’m still seeing if it can be completely fixed to where it will drive the same or not. It’s a project car now. It was my daily driver and I loved it. CM: Do you have any interesting hobbies? What do you do for fun? JM: Other than working on cars and pretty much anything else that’s mechanical or electronic – I’ll tear down and rebuild computers, old bicycles, anything – I spend a lot of time playing strategy games. I play Magic: The Gathering, Warhammer, stuff like that. I’m both a car guy and a geek at heart. CM: What’s your dream car? JM: What I’ve always, always wanted to have is a Caterham Super 7. I’ve just always had a dream of getting one unassembled and building the car from scratch. That’s a car that they sold two ways. You could either pay them to build it for you or you could literally buy a kit and they ship it to you in crates and you build the car yourself. I’ve wanted to build one ever since I found out about them.